We recently rebranded and some integrations may still have NomNom as a name. This will be updated in the upcoming weeks. Our native Salesforce integration allows you to synchronize any customer information and customer feedback stored in your Salesforce instance. You can configure which objects to sync, and in what way. The integration periodically checks for new records in your account and sends them to EnjoyHQ. This integration is different from other ones we offer. It is installed and managed within your Salesforce instance. Currently only Salesforce accounts on Enterprise (and above) plan can install the integration. We're working on listing our integration in the Salesforce App Exchange. In order to install the Salesforce application you have to have administrator privileges or you need to ask the administrator of your instance. The installation consists of two parts. If you installed previous version of the integration, braned as NomNom/NomNom you will have to uninstall it first. Activate the option "install for all users" so that the integration settings can be managed by anyone after installation. Confirm that you allow the application to send your user and feedback data to your EnjoyHQ account. 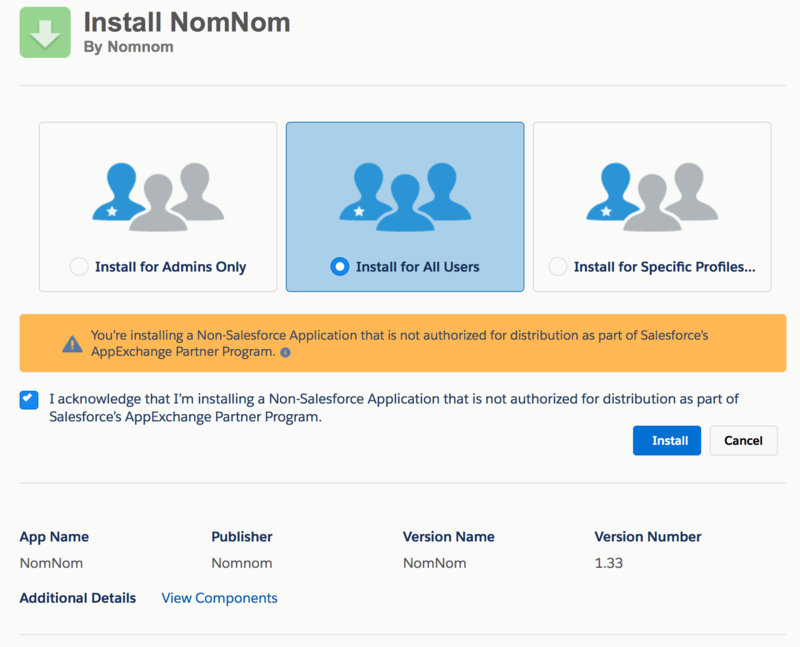 Once Salesforce confirms installation of the package you can move to the next step. If the installation fails with the message "Missing Feature: Apex Classes" - it means that your edition of Salesforce is most likely on Professional or Lightning Essential plan and is not supported. If the installation fails with the message about missing custom objects, please refer to this Salesforce support article - most likely there's a lingering old configuration in your Salesforce account which will need cleaning up by Salesforce's support. When active, navigate to the Authentication tab. From there you will find a handy link which will take you to your EnjoyHQ account where you can generate a new API key. Copy the key and input it in the form shown above. 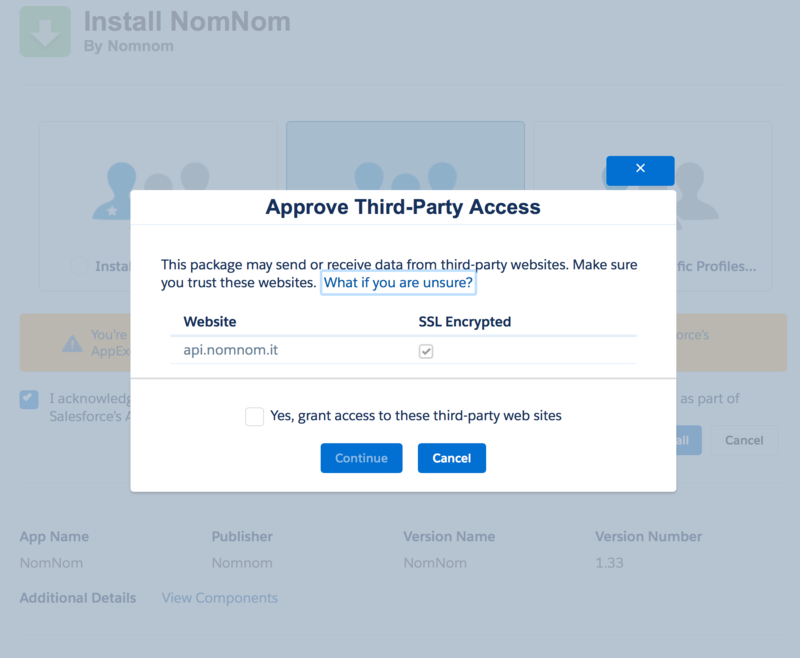 When confirmed (as shown) you can configure what data to send to EnjoyHQ and how. Being a CRM - Salesforce stores a lot of information about your customers. You can not only fetch data about your contacts, but also include data about their parent objects, such as accounts. Once object mappings are configured, the integration will check for new or updated records in your Salesforce instance and send them to your EnjoyHQ account. You can set the schedule interval in the "Settings" tab. Here's an example mapping of Salesforce Contacts to EnjoyHQ's User data, which will be visible in the document's sidebar and people's tab. Just like other integrations - the data fetched from Salesforce will be merged with other data and associated with the feedback across all data sources in EnjoyHQ. When a new mapping is created for the first time, the integration will fetch up to 1000 most recent records. From there it will synchronize any new records added to your accounts on an hourly schedule. When creating a new mapping, it's best to tick the "is active?" checkbox. This means that after saving your mapping - the integration will fetch all existing records and send them to your EnjoyHQ account. The UI allows you to pick the base object (in this example we use Contact) and map its attributes to EnjoyHQ user attributes. Additionally, you can select a parent object - in rows 3 and 4 we've picked couple of attributes present on the Account object, which has been set up as a parent of a Contact. You always have to select the email field - that's how EnjoyHQ will be able to associate user data from different sources. For company properties, we suggest prefixing all property names with "company." - that will ensure consistency in property naming. The most common scenario is to fetch call or task notes logged in Salesforce - these notes often contain feedback from your customers or leads. The UI allows you to pick a base object (in this example we use Task) and map its attributes to EnjoyHQ document attributes. Additionally, you can select a parent object - in rows 6 we've picked the email address of associated Contact object - this will automatically associate feedback contained in the Task comment with a user in EnjoyHQ, just like the task is related to a contact in Salesforce. You always have to select the content-body field - as that will form the content of your document. Additionally, you can map other attributes as document's tags or properties. Just like with User data - it will be refreshed every hour (by default) and synchronize new or updated records. Select an object from "Child Objects" list and map it in a similar way to main document attributes. The comments will then appear under the main feedback content in EnjoyHQ.